Situated on the south bank of the Royal Victoria Dock, the Rank Hovis Premier Mill (left) was built in 1904, by Joseph Rank Limited. The Spiller's Millennium Mills (right) was built by Vernon & Sons and opened in 1905. This was the last of the three big flour-milling factories to be built in the area, making it London's largest flour milling centre. On January 19 1917, at 18:52, the Brunner Mond Munitions Factory, which was situated just 100 yards east of the Millennium Mills, caught fire. The fire ignited roughly 50 tonnes of TNT, which resulted in the complete destruction of the munitions factory, as well as severe damage to the mills and grain silos in the area. The Millennium Mills were pretty much flattened by the resulting explosion. Vernon & Sons were acquired by Spillers Limited, in 1920, who had the Millennium Mills rebuilt as a 10-storey Art Deco building, in 1933. But, during World War II, much of the area was destroyed, again, this time by aerial bombing, which resulted in the the mills having to be rebuilt, yet again. 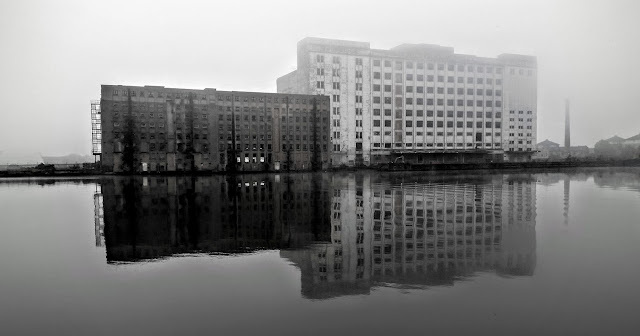 Spiller's Millennium Mills would continue to remain open from 1953 until 1992, eleven years after the Royal Docks closed. There have been many attempts to regenerate the area, including the buildings, since the early 1990s, but none came to fruition. However, as of April 2015, new plans have been unveiled which could finally see a new lease of life given to these imposing buildings of London Dockland's rich history.